Baird-Wilcock will be stepping up as a Director-at-Large onto the Board of Governors of the International Special Events Society (ISES) in August 2015, serving and overseeing education for 53 chapters globally and over 6000+ members worldwide. The Simplifiers specialize in producing non-traditional events with an edge (weddings, corporate and social events). In addition, their latest product offering is The Apprentice Program, an eLearning 6-week online training course for wedding planners and their millennial interns, teaching them to think fast on their feet and learn the critical topics of wedding planning, which is revolutionizing the way event professionals mentor their interns and apprentices worldwide. 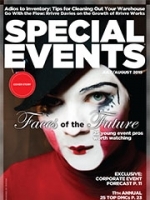 Special Events magazine, founded in 1982, is the oldest trade publication for special events professionals worldwide and has been a partner of the International Special Events Society since 1985. The Simplifiers are an award-winning full-service event planning firm, launched in 2003 and headed by CEO, Mary Baird-Wilcock, CSEP. Thought leaders in online events education via The Apprentice Program and winner of 2015 Best of Weddings by The Knot, Baird-Wilcock is only 1 of 400 worldwide who are CSEP certified as a Certified Special Events Professional…in short, she knows her stuff.